Horst Siebert, who held the Heinz Nixdorf Chair in European Integration and Economic Policy at SAIS’ Bologna Center, died June 2 in the Kantonsspital Munsterlingen in Switzerland. He was 71. 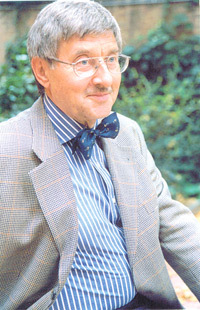 Siebert was a world-renowned economist who helped shape German and European economic policy over the past two decades. The Heinz Nixdorf Chair was the third chair held by Siebert at the Bologna Center. He originally came to the center in fall 2003 as the Steven Muller Professor in German Studies. He was then named to the AGIP Chair in International Economics. Before coming to the Bologna Center, Siebert was president of the Kiel Institute of World Economics. He was a member of the German Council of Economic Advisers from 1990 to 2003. The group, known as the “five wise men” of Germany, advised the government on its economic policies. He also served a term as a member of the Group of Economic Policy Analysis, which advises the European Commission’s president. A prolific author, Siebert wrote numerous books and articles on international trade, the labor market, environmental economics and economic policy. He was the 2007 recipient of the Hayek Prize for excellence in economic writing. He was also the recipient of the Bundesverdienstkreuz, Germany’s federal order of merit; the Karl-Brauer Prize, from the German Taxpayers’ Association; and the Ludwig-Erhard Prize. Siebert had been a visiting scholar in universities throughout the world, including Harvard, MIT, Wesleyan, New York University and the University of California. He received his PhD and postdoctoral degree, or “habilitation,” from the University of Muenster in Germany and was awarded an honorary doctorate from the University of Ghent. Siebert is survived by his wife, Christine, who was at his side when he died.